Director Brad Bird and Producer J.J. Abrams bring us the action packed, entertainment event of the holiday season with "Mission: Impossible - Ghost Protocol." The new film in the series, which has grossed $2 billion dollars worldwide, will feature a new team: Tom Cruise, Jeremy Renner, Paula Patton and Simon Pegg. This is not just another mission. The IMF is shut down when it's implicated in a global terrorist bombing plot. 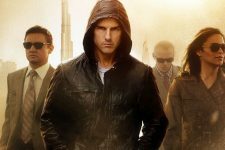 Ghost Protocol is initiated and Ethan Hunt and his rogue new team must go undercover to clear their organization's name. No help, no contact, off the grid. You have never seen a mission grittier and more intense than this.